Eagle syndrome is a set of symptoms associated with an elongated styloid process. Although it is an important cause of cerebrovascular complications such as carotid artery dissection (CAD) or thromboembolism, the condition may be underdiagnosed. We treated three patients with CAD caused by an elongated styloid process within a year. The first patient was a 55-year-old man who developed recurrent thromboembolism despite anticoagulation therapy. Computed tomography (CT) angiography showed bilateral CAD with tips of styloid processes attached to the dissected lesions. 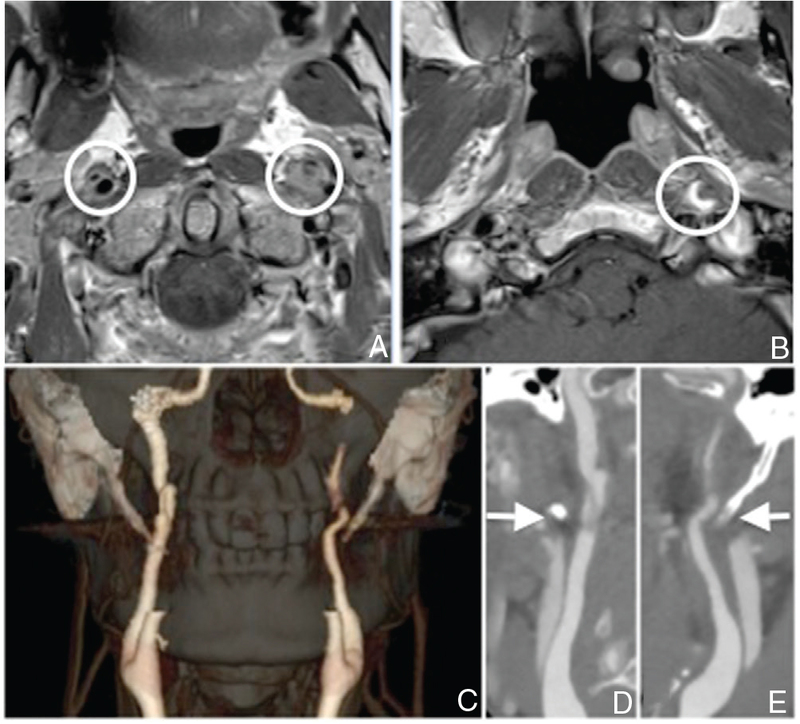 He underwent surgical resection of the styloid process followed by carotid artery stenting. The second patient was also a 55-year-old man who developed acute stroke due to carotid artery occlusion, and underwent thrombectomy and carotid artery stenting. Both these patients experienced resolution of their neurological symptoms and had no recurrence of stroke. The third patient was an 80-year-old man with an asymptomatic dissecting aneurysm of the cervical internal carotid artery. He had a history of odynophagia and underwent surgical resection of the styloid process, with resolution of his symptoms. These cases, taken together with recent evidences showing that CAD was associated with the styloid process length, suggest that Eagle syndrome may not be an uncommon cause of CAD. Examination by CT angiography is important to avoid misdiagnosis. A literature review indicates that some cases were refractory to anticoagulation and surgical resection of the elongated styloid process or carotid artery stenting could be a treatment option to prevent further stroke. The styloid process is considered to be elongated when it is longer than 25 mm. This condition is found in 4% of the general population, but symptomatic cases are much less frequent.1) The elongated styloid process sometimes compresses the glossopharyngeal nerve and surrounding structures, causing recurrent odynophagia and cervical pain. These clinical features were first described by Eagle in 1937, after which the symptoms associated with an elongated styloid process became known as Eagle syndrome.2) Eagle syndrome is classified into classic syndrome and stylo-carotid syndrome.1,3,4) The classic Eagle syndrome is caused by impingement on the glossopharyngeal nerve causing throat pain, pharyngeal foreign body sensation, referred otalgia, and neck pain. This is relatively common and it is well recognized by otolaryngologists. Stylo-carotid syndrome or vascular Eagle syndrome is caused by impingement on the carotid artery. When the elongated styloid process stimulates the sympathetic nerve plexus, it causes pain along the course of the artery. Mechanical damage to carotid artery by styloid process can cause various cerebrovascular symptoms such as visual loss, motor weakness, aphasia, and syncope.5,6) These cerebrovascular symptoms are considered to be caused by direct vascular compression (hemodynamic mechanism), or by dissection and thromboembolism resulting from injury to the wall of the carotid artery.7) As compared to the classical Eagle syndrome, vascular Eagle syndrome is uncommon and is not well recognized as a cause of carotid artery dissection (CAD). However, there are an increasing number of case reports of CAD caused by an elongated styloid process and indeed we experienced three such cases within a year. Thus, vascular Eagle syndrome may not be uncommon disease entity and it should be taken into account as a cause of CAD. We describe three cases of CAD, caused by an elongated process, and review cases reported in the literature. A 55-year-old man presented to an ophthalmologist complaining of recurrent left-sided amaurosis fugax and he was referred to our hospital. On admission, the patient had no neurological deficits. Magnetic resonance imaging (MRI) showed several small infarctions in the left cerebral hemisphere, and magnetic resonance (MR) angiography showed decreased flow in the left internal carotid artery (ICA) and middle cerebral artery. T1-weighted images showed a double lumen in both ICAs, suggesting bilateral CAD (Fig. 1A). Thrombus was observed in the pseudo-lumen on the left side (Fig. 1B). Computed tomography angiography (CTA) showed elongation of both styloid processes (41.9 mm on the right and 36.58 mm on the left), with the tips of the styloid processes adjacent to the areas of CAD (Fig. 1C–E). Cerebral angiography confirmed bilateral ICA dissection. The patient received intravenous heparin and was treated with bed rest and a neck brace. Four days after admission, he developed sudden right hemiparesis and aphasia. Diffusion-weighted MRI showed fresh cerebral infarctions in the left temporal lobe and insular cortex. 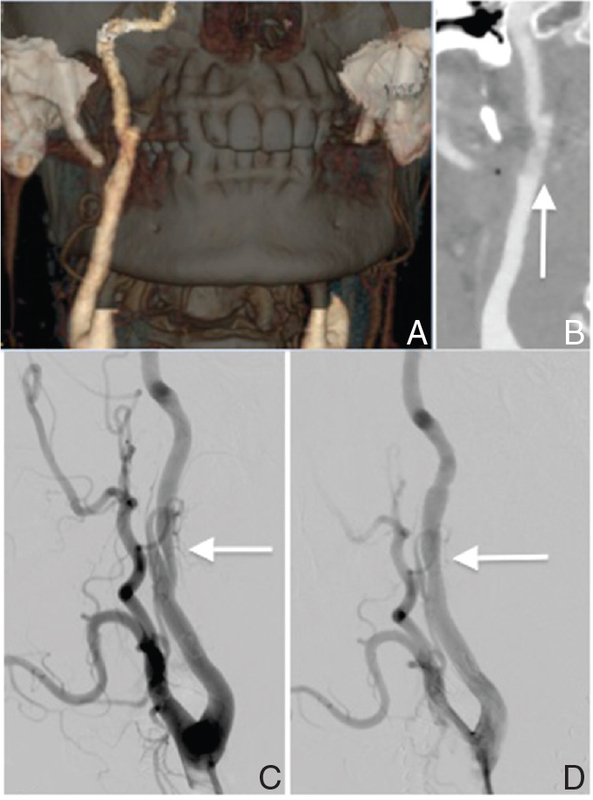 Cerebral angiography showed complete occlusion of the cervical portion of the left ICA. The left middle cerebral artery was supplied by collateral flow via the anterior communicating artery, but the distal portion of the M2 inferior trunk was not visualized. 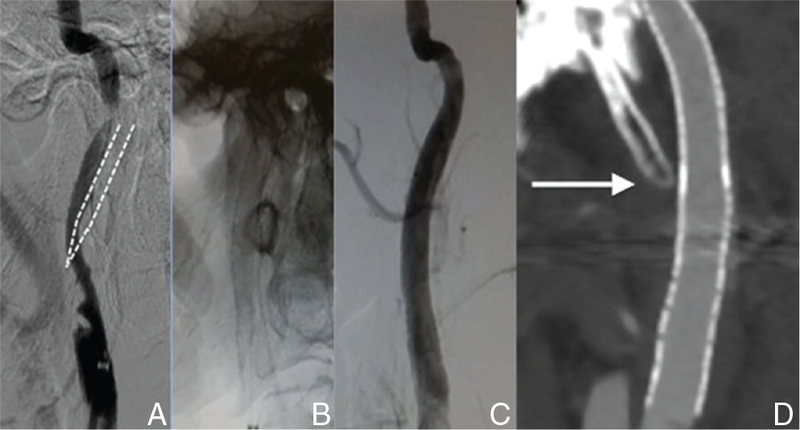 Because repeated compression of the recently occluded vessel may have caused recanalization and subsequent thromboembolism, and progression of dissection on the right side had the potential to cause further cerebral ischemia, surgical resection of both styloid processes and stenting of the right carotid artery were scheduled. Preoperative diagnostic images in Case 1. A, B: T1-weighted magnetic resonance imaging (MRI) images, showing a double lumen in both ICAs (A, circles) suggesting dissection, and thrombus in the pseudo-lumen on the left side (B, circle). C–E: Computed tomography (CT) angiograms of the elongated styloid processes in a 3-dimensional image (C) and maximum intensity projection (MIP) images on the right side (D) and on the left side (E). The styloid processes (arrows) were quite close to the ICAs. Six days after admission, resection of the elongated styloid processes was performed via a cervical approach. Resection was performed on the right side first, to avoid exacerbation of the dissection by rotating the neck. The patient was positioned supine with the head turned slightly to the opposite side and the chin raised. He was monitored for embolization throughout the operation using transcranial Doppler ultrasonography. A skin incision was made just beneath the mandible anterior to the sternocleidomastoid muscle, as for carotid endarterectomy. Dissection was performed in a cephalad direction, while palpating the styloid process. The styloid process was exposed and then drilled and removed (Fig. 2A, B). The following day, after checking that there were no hemorrhagic complications, a stent was placed in the right carotid artery after administration of dual antiplatelet therapy (clopidogrel and aspirin). The PRECISE stent (Johnson & Johnson, Miami, Florida, USA) was carefully deployed to cover the dissection on the right side. The intimal flap and the pseudo-lumen were covered by the stent, and the stenosis of the true lumen was remarkably improved (Fig. 2C, D). After carotid artery stenting, the patient did not develop any further episodes of cerebral infarction, and his sensory aphasia gradually improved. He was discharged from hospital 12 days after surgery, and returned to his job after 3 months. Postoperative images of Case 1 after surgical resection of the styloid process and carotid artery stenting. A, B: Computed tomography (CT) angiogram images after the resection of the styloid process. 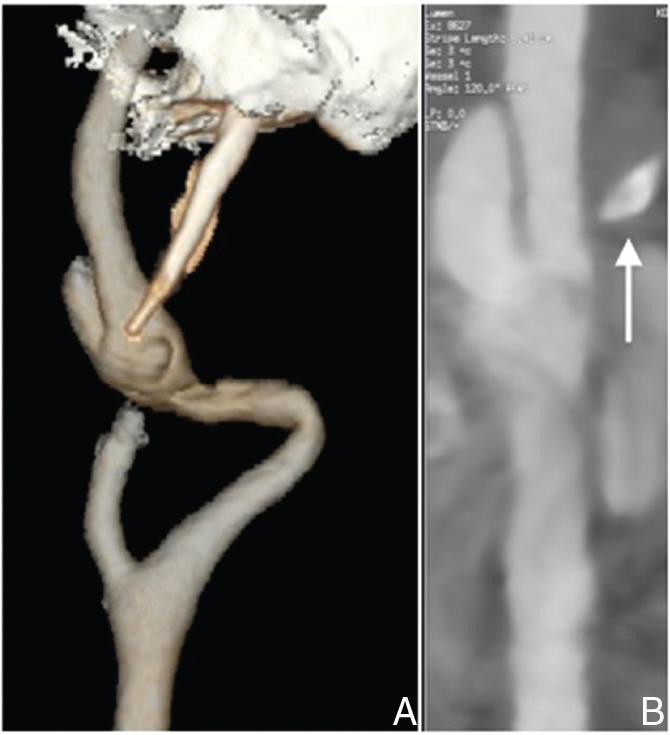 Detachment of the styloid process from internal carotid artery (ICA) was confirmed. Intimal flap in the right ICA was observed (B, arrow). C, D: Right common carotid artery angiogram before (C) and after (D) stent placement. After stent placement, the stenosis in the true lumen has been improved. A 55-year-old man with no vascular risk factors presented to the emergency department with acute left hemiplegia. He had complained of a stiff neck and received a neck massage just before the onset of hemiplegia. On admission, physical examination showed left-sided hemiplegia, sensory disturbance, and hemispatial neglect (National Institutes of Health Stroke Scale score of 11). MR angiography showed complete occlusion of the cervical portion of the right ICA, but diffusion-weighted MRI showed fresh cerebral infarction in only a small portion of the right cerebral hemisphere. Because the patient presented 5 hours after the onset of symptoms, he underwent endovascular thrombectomy. Although early recanalization was obtained using a Merci Retriever, there was remaining irregular stenosis in the recanalized ICA, which suggested preexisting cervical artery dissection (Fig. 3A). A stent (Johnson & Johnson) was carefully deployed to cover the dissection, after administration of dual antiplatelet therapy (clopidogrel and aspirin) (Fig. 3B, C). After endovascular therapy, the patient’s neurological symptoms resolved almost completely. Intravenous heparin was administered for 3 days. CTA performed on the next day showed that the elongated styloid process (34.3 mm in length) was in contact with the dissected part of the right carotid artery (Fig. 3D). Dual antiplatelet therapy was continued and there was no recurrence of cerebral infarction during the next 3 months after the procedure. A: Right internal carotid artery angiogram in Case 2 just after recanalization, showing irregular stenosis in the internal carotid artery (ICA). The position of the styloid process is shown with dotted lines. B: The stent was deployed to cover the dissection. C: Right common carotid artery angiogram after stent placement, showing complete restoration of the true-lumen. D: Computed tomography (CT) angiogram after stenting. The styloid process (arrow) was adjacent to the stented ICA. An 80-year-old man consulted his family doctor because of positional vertigo. MRI incidentally showed a fusiform aneurysm of the left cervical ICA, and he was referred to our institution for management. He had a past history of cholecystectomy, and was receiving medical treatment for hypertension and prostatomegaly. He did not have any preceding headache, neck pain, or neurological complaints other than positional vertigo. However, on detailed questioning, he reported a 3-year history of odynophagia. CTA showed elongation of both styloid processes (42.4 mm on the right side and 45.9 mm on the left side) and an aneurysm of the left cervical ICA (Fig. 4). An intimal flap was observed in the aneurysm, suggesting dissection. The tip of the left styloid process was in contact with the aneurysm. The patient underwent surgical resection of the left styloid process via a cervical approach. After surgery, his odynophagia resolved completely. Because the left ICA was highly tortuous, carotid artery stenting was postponed. CTA performed 9 days after surgery showed that the styloid process was no longer in contact with the cervical ICA, and there was no remarkable change in the dissecting aneurysm. After leaving the hospital, he sustained a severe accidental head injury, and was lost to follow-up. A: Preoperative computed tomography (CT) angiogram in Case 3, showing elongation of the left styloid process. B: The left styloid process (arrow) was adjacent to the internal carotid artery (ICA), causing dissection and aneurysmal change. Although Eagle syndrome is not yet well recognized by vascular surgeons, there are an increasing number of case reports of CAD caused by Eagle syndrome. Indeed, we experienced three cases of CAD caused by Eagle syndrome at a single institution within a year. Eagle syndrome should be considered as an important cause of CAD and subsequent cerebrovascular complications. CTA is a gold standard for the diagnosis of CAD caused by Eagle syndrome. Because CTA is not routinely performed for patients with CAD, vascular Eagle syndrome is unlikely to be diagnosed by chance. In addition, bony structures are often removed in 3-dimensional volume-rendered CTA images, which may also make it difficult to reach the correct diagnosis. Therefore, it is important to include this syndrome in a differential diagnosis of CAD and to check the relationship between the styloid process and ICA by the maximum intensity projection or the original 2-dimensional images. Precipitating factors such as neck rotation, bilateral lesions, referred facial pain, or recurrent episode of stroke can be an indicator of vascular Eagle syndrome. Recently, several independent studies showed that CAD was associated with the styloid process length or styloid-ICA distance.8–10) Direct mechanical contact was more common in patients with CAD than control subjects.9) These studies imply longer styloid process and shorter stylo-ICA distance are the important risk factors causing CAD. Interestingly, Tubbs et al. examined the relationship between stylopharyngeus muscle, which is extending from the styloid process, and ICA in 20 adult cadavers.11) They found that ICA was compressed by the muscle in five sides (12.5%) and neck rotation increased the degree of compression. This implies CAD may result from not only the direct injury of the styloid process itself, but also indirect injury of the surrounding structure. In either case, assessment of the anatomic relationship between styloid process and the carotid artery by CTA is very important in patients with CAD. Because the risk for CAD attributable to the elongated styloid process is still unknown, preventive resection of the elongated styloid process is not recommended. Although the treatment strategy for CAD caused by an elongated styloid process is not well established, the first-line treatment for ischemic stroke associated with vascular Eagle syndrome would be anticoagulation therapy as reported in previous literatures.7,12–18) When patients experience recurrence of stroke despite medical treatment or have disease-related pain, surgical resection of the elongated styloid process should be considered as presented in our case 1. Carotid artery stenting can be another option for the treatment of stylo-carotid symptoms of Eagle syndrome as shown in our case 2 especially when the patient had sudden onset of carotid artery occlusion, but the efficacy of stenting for this syndrome is not well established.7,16) A recent report described intra-stent thrombosis and thromboembolism of the distal cerebral artery after carotid artery stenting, requiring subsequent surgical resection of the styloid process. Thus, close follow-up will be necessary for patients with vascular Eagle syndrome treated by carotid artery stenting. We reviewed 12 cases in the literatures including ours as shown in Table 1.7,12–18) Mean age at onset was 50.4 (range 38 to 80) and most were in 40s and 50s. Female to male ratio was 2 to 10, showing male predominance. In terms of laterality, 3 patients had left lesion, 6 had right lesion, and 3 had bilateral lesions. Seven out of 12 patients (58.3%) had precipitating factor such as head tilting or cervical massage. Nine cases developed ischemic stroke. Seven cases out of nine were first treated by anticoagulation, and the other two cases were initially treated by endovascular thrombectomy with carotid artery stenting because of major cerebral vessel occlusion. Three were refractory to the initial treatment. Two were refractory to the intravenous anticoagulation therapy and further treated by surgical resection of the styloid process or carotid artery stenting. The other patient had recurrent episode of stroke during dual antiplatelet therapy after carotid artery stenting, which was finally treated by surgical resection of the styloid process and free from recurrent episode of stroke. A total of 5 cases were treated by surgical resection of the styloid process and none of them had recurrent episodes of stroke. Four patients were treated by carotid artery stenting and one had recurrent episode of stroke, as mentioned above. F: female, M: male, CAS: carotid artery stenting, ICA: internal carotid artery, SP: styloid process, rtPA: recombinant tissue plasminogen activator. In conclusion, an elongated styloid process is an important cause of CAD and subsequent cerebrovascular complications. CAD caused by Eagle syndrome may occur more frequently than expected, and should be considered in the differential diagnosis of CAD. CTA is useful in confirming the diagnosis. Although anticoagulation therapy is the first-line treatment, some patients develop progressive disease and need immediate surgical intervention. The authors thank Drs. Shoichi Tani, Hidemitsu Adachi, Chiaki Sakai, Hirotoshi Imamura, Tatsuya Ishikawa, Tomoyuki Kono, Katsunori Asai, Hiroyuki Ikeda, Taku Inada, Teshiki Shibata, Mikiya Beppu, Yoshitaka Tamaki, Masaya Togo, Kampei Shimizu, and Yuji Agawa for their support in patient care. The authors report no conflicts of interest concerning the materials or methods used in this study or the findings specified in this article. Produced and listed by : Medical Tribune Inc.